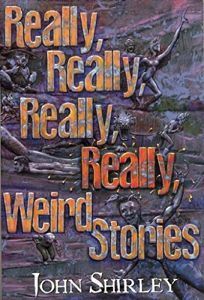 The 37 stories in this mind-shaking collection are grouped into four sections of ascending weirdness, from Really Weird to Really, Really, Really, Really Weird. Considering that the first entry, I Want to Get Married, Says the Worlds Smallest Man, concerns a 28""-tall midget who weds a full-size, crack-smoking whore, to brutal effect, readers may rest assured that an unforgettable trip awaits them from cover to cover. But weirdness per se doesnt seem to be Shirleys aim, except insofar as outr subject matter (as in Skeeter Junkie, wherein the mind of a heroin addict enters the body of a mosquito) or prose style (e.g., the sentences of the potent and moving Ten Things to be Grateful For, as long and sinuous as anacondas) can wrench readers from their habitual frame of reference to experience the world afresh. The author of last years Black Butterflies demonstrates throughout a fecund imagination, wicked sense of humor and thematic seriousnessregarding the malleability of reality, the hellishness of drug abuse, the fragility of human constructthat render these tales as profound as they are sensational. Selected from 26 years of output, ranging from SF to dark fantasy to crime, drawn from books, magazines and a Web site (and with 10 entries never before published), the collection isnt all aces. But the majority of stories are, making this another virtuoso offering from a writer whose daring and originality continue to astonish. (May) FYI: Shirley has been nominated for two 1998 Bram Stoker Awards, for Long Fiction (What Would You Do for Love?) and Fiction Collection (Black Butterflies).